Filing taxes can be stressful enough even when you work for someone else. 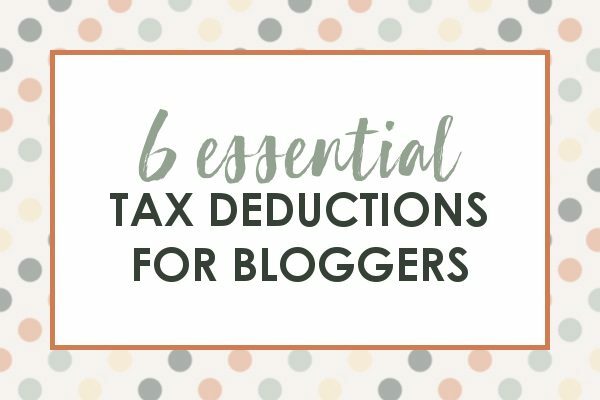 But when you’re filing small business taxes, especially as a blogger, you really need to make sure you have all your bases covered! Please note: I am not a tax professional, nor do I claim to be. Do your due diligence before filing! Whether this is your first year as a blogger, or your 8th, filing taxes is something that never goes away. If you want to make sure you’re doing everything right then you’re in the right place! From which accounting methods to use, to all the deductions you can take, this post has you covered! Plus, grab the free income and expenses tracking spreadsheet at the very end! There are two different ways to keep track of your income and expenses as a blogger (or any small business): Cash and Accrual. What’s the difference between the two you might wonder? The main difference between the accrual and cash accounting methods can be found in the timing of when income and expenses are officially recognized. The cash method is mostly used by small businesses (yay bloggers!) and for personal finances. This method accounts for revenue only when the money is actually received and for expenses only when the money is actually paid out. However, the accrual method accounts for revenue when it is earned and expenses goods and services when they are billed. So, for this method the revenue is recorded even if cash has not been received or if expenses have been billed but no cash has been paid. For example: Let’s say you wrote an book this year that you sell on Amazon. If you sell $5,000 worth of books and also get a bill for $500 from your hosting service, here’s how you would record those for each type of accounting method. The cash method would have you record the earning for the books ONLY when Amazon actually pays you. That is, when the money is actually in your bank account. For the bill, you would only record it when you actually PAID the money and it left your account. Under the accrual method would have you record your sales in the month that you creating any earnings (whether they are paid out or not), and the bill would be recorded upon receipt instead of payment. This same method of recording would apply to any products you receive for free throughout the year. Which Accounting Method Should You Use As A Blogger? While this decision is ultimately up to you, paying taxes on money you haven’t been paid yet can be difficult for most small business owners. The cash accounting method lets you pay taxes ONLY on what you’ve been paid during the calendar year in question. This year, had I paid taxes with the accrual system I would have had to pay taxes for over $10,000 worth of income that I had yet to receive. No thanks! However, regardless of which method you choose, you will need to stick with it from here on out. You cannot change methods from year to year (well you can, but you have to fill out a form and it’s a whole big mess). When you enter your income and see how much money you’re going to owe, you might freak out for a second. Take a depth breath and remember that you still need to enter your deductions!! So what deductions can you claim as a blogger? There are quite a few actually, you might be surprised! Operating costs may be broken down into two categories. Yearly Expenses, such as software licenses, yearly hosting payments, scheduling software, plugin upgrades, or domain names. And Monthly Expenses. If you pay for hosting, newsletter services, scheduling services, or plugins on a monthly basis those would fall under this category. Yearly and Monthly expenses can be lumped together under “operating costs”, but I like to keep them separate to make sure I’m not claiming something twice. Yes! Advertising can be a very large deduction. Did you run Facebook, Pinterest, or Instagram promotions this year? Add up the total cost and make sure you claim that as advertising costs! Business cards, posters, and trade show fees would also go along with advertising. Training is a big one that gets forgotten sometimes! Did you buy ebooks or courses to help you in your blogging business? That’s all deduct able under training! Even that $20 book you bought needs to go on the list because it all adds up! This is another great one that I actually almost forgot about this year. Did you have someone work on your blog or social media accounts, or even pay to have someone create a logo or image for your site? That’s all deductible!! Affiliate payments made can be claimed as deductions under the “commission” tag. So if you have an affiliate program for your products, you can claim ever dollar that went back to your affiliates as a deductions. They are non-employees so be sure not to file as though they are! I’ll talk more about the specifics of affiliate payments in the next section. If you use PayPal, Stripe, or any other payment processing service to accept payments for your business, make sure you are deducting their fees! For example: On Stripe if you sell a $20 product, Stripe keeps $0.88 cents of that transaction. So you end up with $19.12. By deducting those fees you are making sure to only pay on the money you received! That’s ok! It happens to the best of us, especially when you are first starting out. Grab my income and expenses spreadsheet at the bottom of this page and start filling in all the spaces by combing through your emails for receipts. Also, go through your bank statements month by month (as well as any only payment options you use, like PayPal or Stripe) to find transactions relating to your blog. For hosting and domain purchases, as well as scheduling software and social media advertising, you can go directly do your account page with those services to find your billing history. The only thing you need to do for your affiliates, other than pay them at the agreed upon time and claim those payments as a deductions, is to send out a form to certain affiliates. Any affiliate that earned and received more than $600 with your program in the last calendar year should be sent a 1099-MISC tax form in Box 7, Non-employee Compensation. You’ll need their SSN for this. The deadline for the 1099-MISC form to be sent is January 31st. You can file a 1099-MISC online with the government, just be sure to also send one to the affiliates in question. You can do this electronically or by mail. Ready to make sure you have all your ducks in a row? Use this free income and expenses spreadsheet to get your numbers ready to file your small business taxes! When you open the spreadsheet, be sure to save a copy on your own drive so that you can edit it easily. Then, just add your sources down the left side and the totals for each by month across. The totals will be automatically updated at the bottom! Please note that there are 3 sheets to this spreadsheet: Earned Income, Received Income, and Expenses. Note: If you are already a member, click here to visit the member only library for your download. Enter the password at the end of every newsletter! Fantastic article! This is such a clear and concise explanation of taxes. Thank you so much! This was SO helpful! This is my first year claiming income as a blogger, and I didn’t even think about several of these things! Thank you!